While working on my current Maggie Sullivan mystery, I wanted to make sure when World War II blackouts went into effect in the United States, especially in Dayton, Ohio, where the series takes place. After all, private eyes wouldn’t be private eyes if they didn’t do a great deal of creeping around at night! What will be book #6 in the series takes place in the spring of 1942. Despite nationwide fear of air attacks, however, local historian Curt Dalton writes in his book Home Sweet Home Front: Dayton During World War II, that the city’s first total blackout wouldn’t take place until a year later, on May 27, 1943. Ah, but here’s where researching historical fiction yields countless collateral dabs of information that can enrich a story — and make the creative process just plain fun! Note the lack of shiny surfaces on this WW2 “blackout car”. Although buildings and streetlights weren’t blacked out until 1943, vehicles were. I’m not talking about extinguishing headlights and taillights. I’m talking about creating what a whimsical turn of mind could view as the 1940s version of stealth technology. Applied to cars. Just a few weeks before the surprise attack on Pearl Harbor on Dec. 7, 1941, production of new 1942-model cars had begun. It screeched to a halt as the US government almost immediately classified chromium as a strategic material since it was needed in the manufacture of stainless steel and necessary to the war effort. The nation’s auto manufacturers were ordered to eliminate “brightwork”, the chrome and stainless trim on cars, within one month. They would have to end production of passenger cars altogether in two months in order to switch to production of military trucks and ambulances, tanks, and aircraft engines. The few thousand new cars produced in the weeks between when the supply of shiny parts ran out and early February of 1942 when US passenger car production ended entirely are known as “blackout specials”. Normally shiny parts were painted black, gray, olive drab or similar dark color. In some cases the trim was a color that looked attractive with the car’s background color, a decidedly unflamboyant relative to today’s pin stripes and detailing. Surviving cars, and even photographs, are rare. The same flat, non-reflective painted trim was used on military vehicles as well. What color do you think Eli and Calvin at Wheeler’s garage paint the trim on Maggie’s DeSoto? 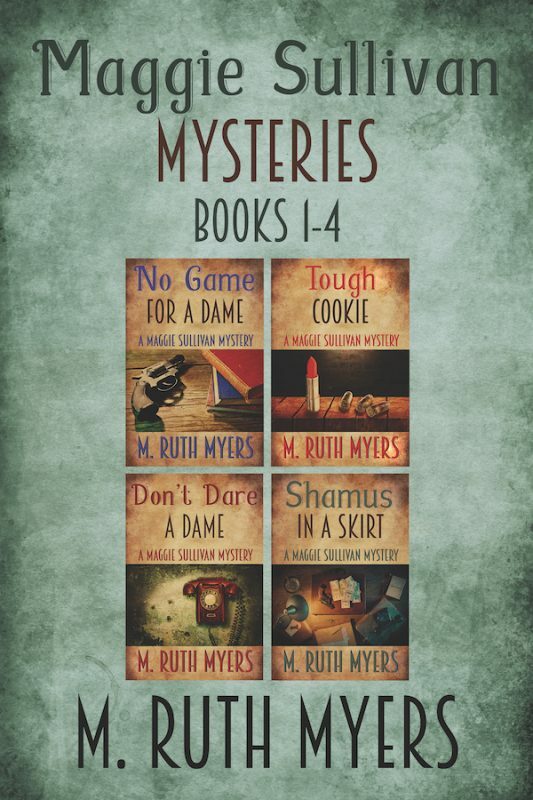 Get Maggie Sullivan mystery #1 FREE! Black. It goes with anything and keeps in with the “blending into the background of the night time! I had no idea about these blackout cars! Good tidbit to keep in mind when I return to my fiction WIP. It’s set in Washington DC during WW2. What year was Maggie’s DeSoto ???? I have several pictures taken 1942-1945 of my parents’ and grandparents’ pre-war cars, but none show the bumpers or brightwork painted over. I do know that quite often the steel bumpers were turned in on scrap metal drives and replaced 2″x6″ planks. Looking forward to Maggie Sullivan’s #6…. I don’t think I ever mention the year in the books, but it’s a 1937 DeSoto Business Coupe, and it’s gray. If you happen to have a photo of one of those (any color) I would absolutely love to post it! Thanks for the info on steel bumpers being turned in on scrap metal drives and replaced by planks. I hadn’t come across the wooden planks part before. Do you happen to have any photos of? I came across this “office of war information” photo . When enlarged shows a great deal of detail (gas ration stickers etc..) Note several Packard “Clippers” that were not produced untill mid 1941 and the 1942 Buick.